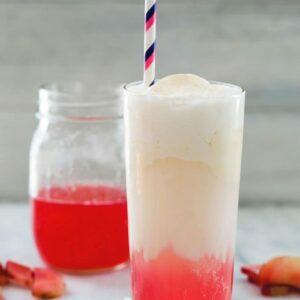 This Tipsy Rhubarb Ice Cream Soda takes a brilliantly pink rhubarb simple syrup and combines it with vodka, vanilla ice cream, and soda water for a delightful summer treat. Feel free to leave the vodka out to skip the “tipsy” part. Rhubarb and I have quite a sad history together. Actually, I should say rhubarb and I essentially have no history together. 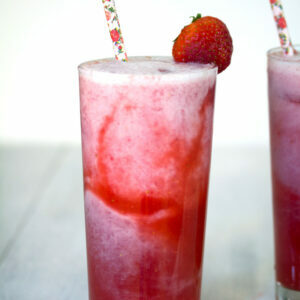 This drink slash dessert is literally the only thing I’ve ever made with rhubarb. BUT that doesn’t stop me from saying at least 35 times per spring/summer, “omg I’m totally going to cook and bake with rhubarb all the time this year!” And then I never do. And look at me now… I finally have a bundle of rhubarb and I’m re-making a recipe that I first made in 2014. But the thing is, rhubarb and I need to spend a little quiet 1:1 time together getting to know each other. I’m slightly uneasy around rhubarb, I’m definitely a bit confused by rhubarb, and I’m still kind of getting a handle on how I really feel about it. 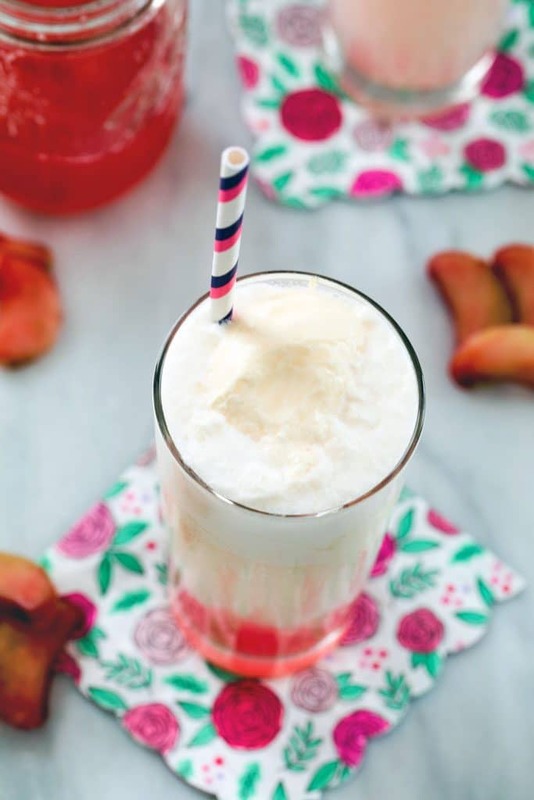 This Tipsy Rhubarb Ice Cream Soda is like training wheels for rhubarb and I’m OK with that. Can we all please start by admitting that rhubarb is totally weird?? Does anyone really know what it is? While I often refer to rhubarb as “celery’s fun cousin,” it’s not actually in the celery family and is instead part of the Polygonaceae plant family (along with sorrel, buckwheat, sea grapes, and some pretty nasty weeds). Though rhubarb has been used in Chinese medicine for thousands of years, utilizing rhubarb as food is a relatively new innovation, starting in 17th-century England. The stalks are the edible part of rhubarb and the leaves should be avoided due to their high levels of oxalic acid. If you’ve ever tried rhubarb plain, you know that it’s extremely tart and generally needs a bit of sugar. In fact, in some countries, kids are given rhubarb stalks dipped in sugar as a fun little treat. Knowing that sugar is generally need in the preparation of rhubarb, I thought, what could be better than a rhubarb simple syrup? This allows you to get the full flavor of rhubarb, without covering it up with other flavors. If you’re a rhubarb newbie, this is a great way to get a feel for how it tastes. You make the rhubarb simple syrup the same as you would any other simple syrup; it’s just sugar, water, and chopped rhubarb. Let it simmer for about 10 minutes and then strain the liquid from the mushy rhubarb. I was about to throw that mush away, but then I tasted it and omg it was so good! It tasted just like applesauce would… Rhubarb applesauce for the win! 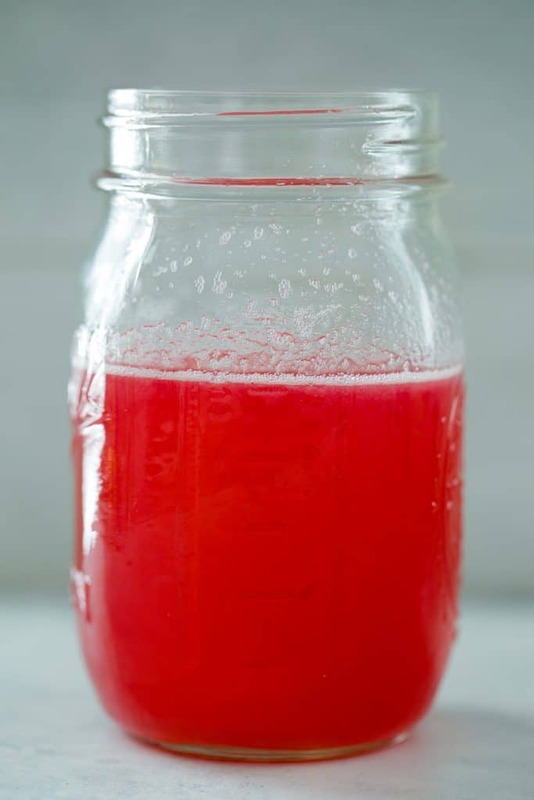 As you probably guessed, I’m pretty much in love with the hot pink color of this rhubarb simple syrup. I want to keep a jar of it in my fridge for all time. Did I mention I want summer to last forever? The rest of the cocktail prep is super easy as most of my drink recipes are. Pour the simple syrup and vodka into two glasses and then add a couple small scoops of ice cream. And fill the rest of the glasses up with soda water. Until they’re practically overflowing. Because it’s pretty much a necessity that an ice cream soda overflows. And I would call my first foray into rhubarb a success. OK, so technically this is my second foray considering I’m re-making this recipe. Just four years in between my two rhubarb experiences? I really can’t let that much time go by again. The thing is… rhubarb isn’t my absolute favorite fruit/vegetable of all time and there are a million other pie flavors I’d choose before a rhubarb pie. But this rhubarb simple syrup? It is pure delight! And I know there are more ways I can experience rhubarb that will likely help me fall in love with it. Luckily, rhubarb is in season until September, so I should be able to get a few more rhubarb recipes in over the next few months. 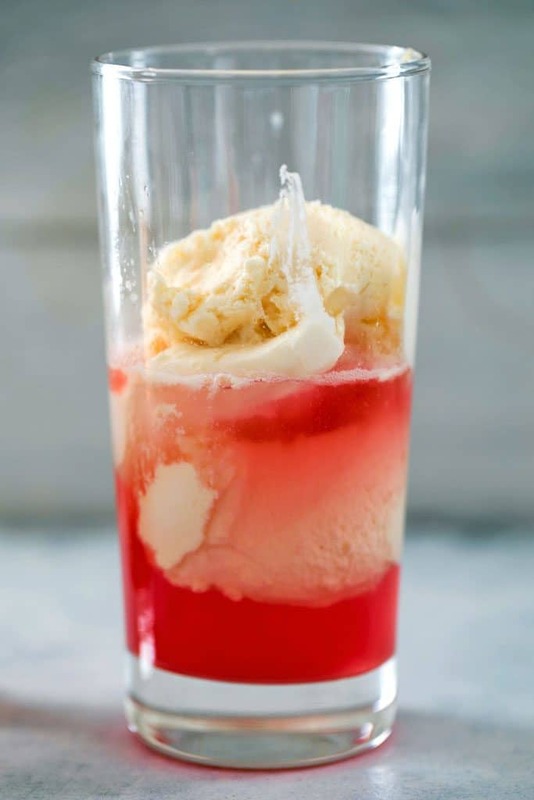 But something tells me this rhubarb simple syrup will also be made again… Because yes, I absolutely need a jar of hot pink simple syrup in my fridge at all times. Please share your favorite rhubarb recipes with me, so I can broaden my rhubarb horizons! If you’re looking for another “tipsy” ice cream drink, check out my Bourbon S’mores Milkshake! 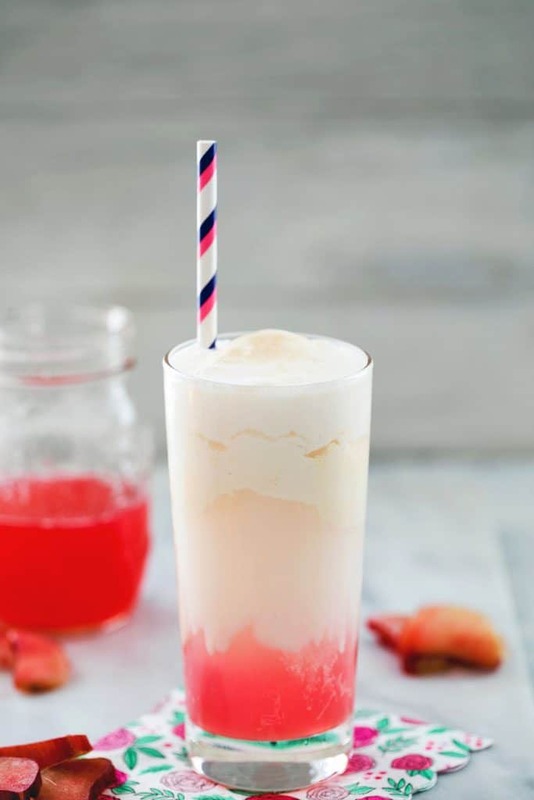 This Tipsy Rhubarb Ice Cream Soda takes a brilliantly pink rhubarb simple syrup and combines it with vodka, vanilla ice cream, and soda water for a delightful summer treat. Divide simple syrup and vodka between two glasses and then add two small scoops of ice cream to each. Fill the rest of the glasses all the way up with soda water. Serve with straws. In a medium saucepan, bring sugar, water, and chopped rhubarb to a boil. Lower heat and let mixture simmer for about 10 minutes, until sugar is dissolved and mixture has thickened a bit. Remove saucepan from heat and strain the syrup into a heat-proof bowl. 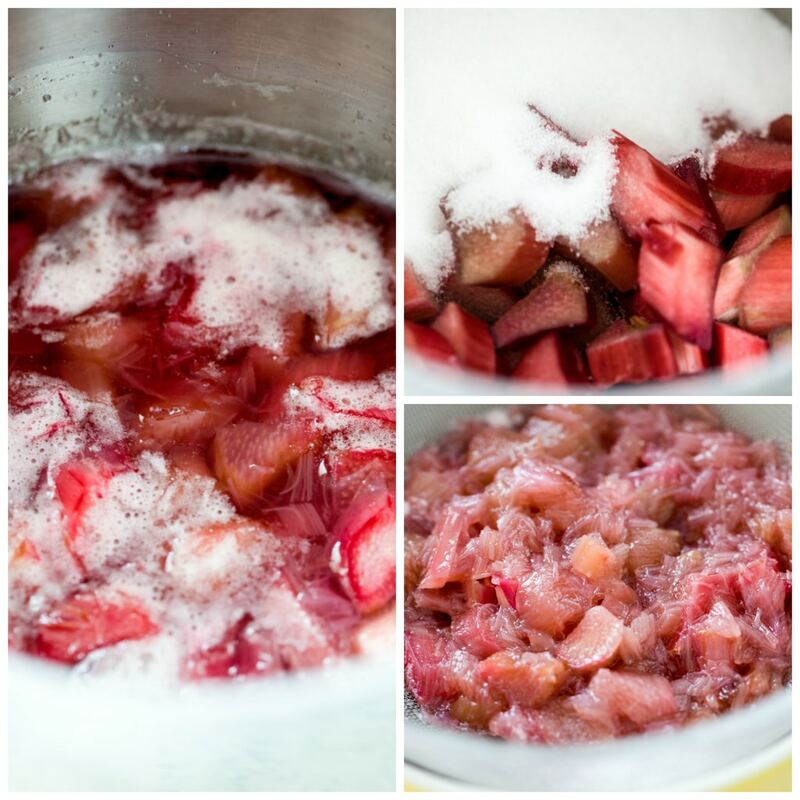 Press down on the mushy rhubarb to extract as much liquid as possible from it. Dispose of rhubarb mush or eat it like applesauce! Put syrup in the fridge to let it cool completely. Feel free to leave the vodka out of this ice cream soda if you prefer. 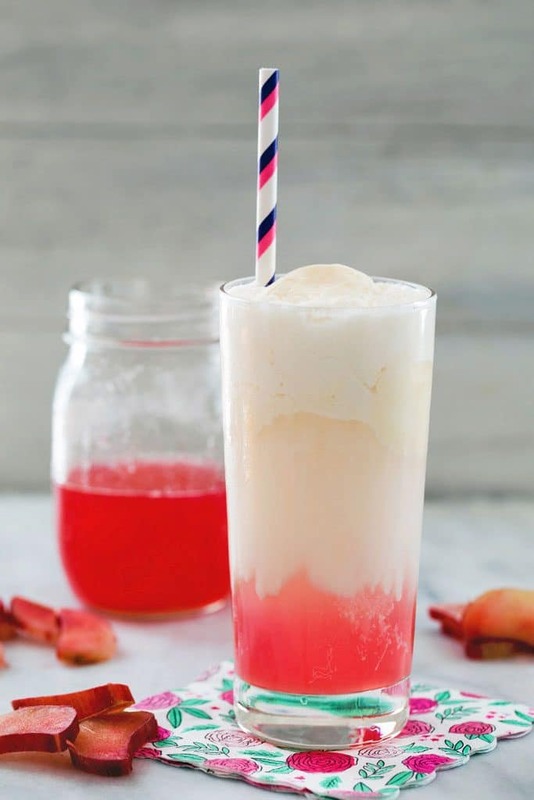 25 Responses to "Tipsy Rhubarb Ice Cream Soda"
This looks incredible, Sues! I’m a newcomer to the rhubarb game but have loved it the times I’ve had it, so it’s been on my to-do list to cook with for awhile. Combined with ice cream and vodka sounds decadent (and delicious). Yum! I am WITH YOU girl! If summer didn’t end for another few months, I would still think it was too soon! I haven’t cooked/baked/cocktailed with rhubarb since the spring…so I think I am long overdue for one of these. 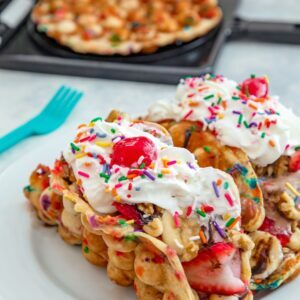 i am loving all of your boozy recipes! i have never cooked with rhubarb and am actually pretty intimidated by it. this cocktail looks beautiful though! old school and I LOVE IT! An ice cream float with alcohol is the best kind there is! I plan to continue wearing my white jeans too for the rest of the month! I love making rhubarb simple syrup for cocktails this time of year! 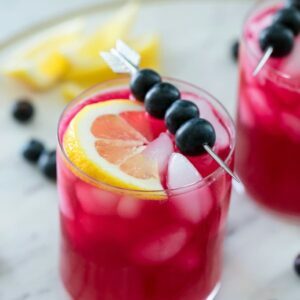 Oooo this color is so lovely and I’d love this cocktail. right. now. Oooh yum! I need one of these right now!! I’m with you… let’s keep this summer thing going! The syrup sounds awesome. I made a rhubarb compote with cardamom custard once. It was awesome. Not sure why I haven’t cooked with rhubarb since. I have made a rhubarb crumble, but this looks way more impressive and tasty! I LOVE rhubarb! Isn’t it so pretty and versatile? 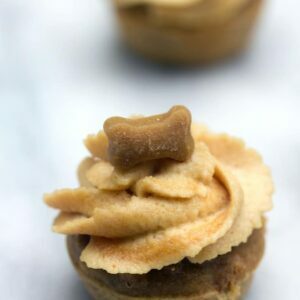 Your recipe is adorable, I can’t wait to try it for myself. Anything ‘ice cream soda’ gets my vote, but particularly a creative and pretty one like this! Isn’t rhubarb the best? While I hardly ever bake with it, I do try to eat it at least once a summer, usually in strawberry rhubarb pies! 🙂 This ice cream soda sounds amazing! So perfect for a hot day! What a great idea, I’m impressed! For your first time a drink sounds perfect! I ALWAYS forget about rhubarb. But how could I? It’s so fun! Yes! I am up for any cocktail with ICE CREAM in it. And rhubarb has such a wonderfully summery feel to it. Loving this cool drink! Yummy! This is now my new favorite summertime drink of choice! Yum! You absolutely had me at “rhubarb”!! So bookmarking for this summer’s party plan!! !